Gucci By Gucci Homme Deodorant Spray. 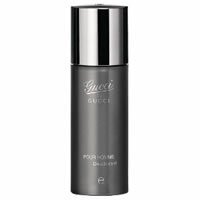 Gucci By Gucci Homme Deodorant Spray is gentle and effective. Gucci By Gucci Homme is a subtle woody chypre fragrance for men. Gucci By Gucci Homme is a signature scent for a modern man with echoes certain elements from the house's heritage, like the silvery signature of Guccio Gucci, founder of the brand and the Gucci stripe and horse bit. Gucci By Gucci Homme begins with elegant Bergamot, Cypress and Violet, intensified by a heart of Black Pepper, Frankincense, Leather and Tobacco and a base of Patchouli, Cedar and Amyris.